Mangala Samarakoon is a lad from the wilderness who has a certain talent which is there to be developed and developed in the right manner and the investment may never cease to surprise the rest of Sri Lanka. Where is Sri Lanka heading to in the world of athletics or for that matter in sports in general?� A rather broad based question, but there is one definite answer – nowhere. For the 30th edition of the Olympics, Sri Lanka has brought seven athletes, out of which only one had really qualified with the balance six making it through various methods. Niluka Karunaratne – the shuttler who came into London with the merit of being the world’s 48th ranked player, was a confident performer and had the wherewithal to bewilder the world no. 8�� Tago Kenichi of Japan in straight sets in just 46 minutes to become the first Lankan to move on to the second round so far in any given discipline. At the same time the other shuttler Thilini Jayasinghe, though in her second outing at the Olympics, seemed more content with just taking part and losing rather than carrying the national cause to another level.I am not blaming the young female badminton player. Given the chance any athlete would risk their hand or limb to get the nod to partake in an Olympics. Here what is lopsided is the system that prevails. 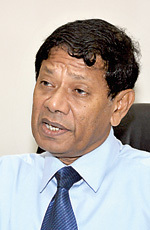 The system that is prevalent in Sri Lanka has a colander effect, where efficiency sieves through holes and other ingredients get priority.Recently, during a chat with the Sunday Times, the Minister of Sports Mahindananda Aluthgamage stated that he intends putting a lot of emphasis on the development of sport in the country. However he reiterated that what he had in mind was not high flown stuff like the Olympics, but the closer to home stuff like the South Asian Federation Games. He said that the ministry has already put the nuts and bolts in place and his officials are on the prowl for talent and have already stumbled upon some young talent that could yield good results at that level.The Minister also added that at the 1991 SAF Games Sri Lanka did really well, winning 44 golds, 34 silvers and 40 bronzes, making it a total of 118, but since then the general graph has pointed down rather than up. Now how can we cure this malady? What we see here is a case of official bungling and not a case of running out of talent. The second reason is the desire to excel is not inculcated in individual athletes at a young age. They are not given a proper mindset and possible goals. The system in Sri Lanka waits for the individual to come up and then tries to harness their talent. There are some fundamental facts that are hard to break. For instance, though there is large scale official bungling and system breakdowns in cricket in Sri Lanka, the talent base keeps growing unceasingly. Why? Because cricket as a game has proven itself in the country and the game right now is on top, and any youngster knows that if he can do well in that sport the sky is the limit. So, amidst official bungling and other pitfalls, talent keeps streaming in through various ways and the game has travelled up in the scale since it got official status in 1982.� The reason is that the game of cricket has taken deep root in society and the younger generation looks at that sport as an avenue in which they could excel. That is the culture that must be inculcated. The Lankan authorities, instead of turning the steering wheel without knowing their destination, must haul up talent at a young age and, like in China, develop their skills with all modern technological input and also see to it that the athletes have an afterlife. Someone may turn around sneeringly with the argument that how can Sri Lanka, a not-so-developed country, do what China has done? No, the argument is that we could scale things down to just one or two disciplines and pump those with the best technology and expertise and begin to yield results through them on a regular basis so that the boy next door also would want to take up that sport and become a personality. For instance Mangala Samarakoon, the Air Rifle shooter, is a Wild Card at the 2012 Olympic Games.� He is also an athlete who has achieved a personal best of 587 in Sri Lanka, out of a possible 600 marks, punched 579 at the last Asian Games and achieved a personal best outside Sri Lanka of 283. At the same time he was shooting outside his pet 50 metre event. To add to his woes, according to him, he only had two sessions of practice before he stepped on to the shooting range. Yet the lad from Davuldena in Nuwara Eliya went shot for shot with the best in the world and in spite of finishing in the bottom half did well. This is the other talent that we can harness. Yes, these Olympic Games are a few hours too late for Samarakoon.� But, the determination and the dedication in his eyes told a different story. This is talent that the country could boldly invest in. We may be able to put a lot of eggs in this basket and develop the talent that he already has. First the authorities must understand his mental status. He is a lad from the wilderness who has a certain talent which is there to be developed and developed in the right manner and the investment may never cease to surprise the rest of Sri Lanka.